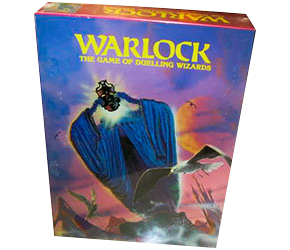 Players cast spells on each other in the arena trying to banish their opponents into limbo permanently. An unassuming little card game of duelling wizards from way back in the early days of Games Workshop—that is to say, before they were run by corporate lawyers and limited IPs. Fantastic, characterful art from illustrator Russ Nicholson.